There are easy solutions available at your local dentist’s office to prevent grinding and protect your teeth from damage. The simplest solution is to wear a custom-made mouth guard, night guard, bite guard or similar appliance designed by your dentist. Fillings do just what the name implies — seal a small hole in your tooth, i.e., a cavity, caused by decay. This prevents the decay from spreading further into your tooth. A veneer is a wafer-thin layer of super-strong porcelain that convincingly substitutes for natural tooth enamel. Trust Mitchell S. Pasenkoff D.M.D. for superior dental care. He and his staff provide patients with quality care at their dental office in Norfolk, Massachusetts. Our goal is excellent oral health for each of our patients through state-of-the-art procedures performed by an experienced dentist and his staff of well-trained dental hygienists and dental assistants. Contact our office today to schedule an appointment to have your teeth cleaned and examined. For quality dental care, can count on Mitchell S. Pasenkoff D.M.D. He provides general and cosmetic dentistry for patients of all ages. We care about your dental health and love to see you smile! Schedule your dental cleaning, checkup and more, we look forward to seeing you. Don't live in pain of cracked, chipped, or missing teeth. 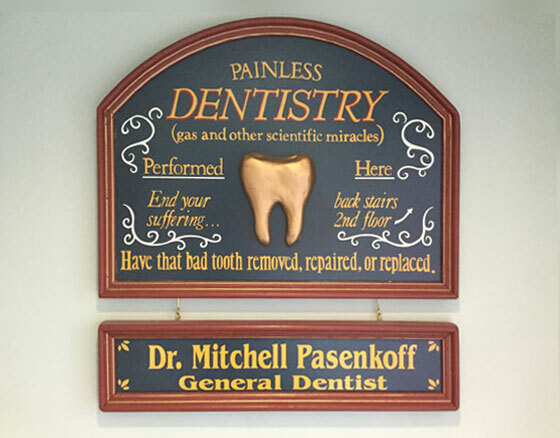 Visit us at the dental office of Dr, Mitchell Pasenkoff. We offer many restorative services to improve your oral health, and your beautiful smile. Your smile should be everyone's first impression, make sure you are proud of it! From teeth whitening and crowns and bridges to dentures, Dr. Mitchell Pasenkoff works with you to offer the perfect solution for the gorgeous smile you are dreaming of. Dr. Mitchell S. Pasenkoff has been practicing dentistry in Norfolk for 18 years. As a native of Staten Island, NY, Dr. Pasenkoff received his B.S. degree from SUNY at Stony Brook and his D.M.D. degree from Tufts University School of Dental Medicine in 1986. He is a former assistant professor at Boston University School of Graduate Dentistry.